Looking for a fun and unique way to fill those Easter baskets? Why not fill them with kid-friendly bath time products, including Yum! Spa® Face Mask and Bath Bombs, Mr. Bubble® Foam Soap, Bubble Bath and Magic Bath Crackles, and Nourishing Naturals Foaming 3-in-1! My daughter isn't super big into candy (lucky for me) so I always try to fun fun and unique ideas for filling her Easter basket. Lately she's been big into taking baths instead of a shower so it's going to be fun adding some of these super cool bath products to her basket. She's gonna love having a little extra fun in her bath for sure. The new Yum! Spa Paint-sicle Face Paint Spa Clay Mask comes packaged in a fun two-toned popsicle design to make cleansing fun and colorful. Made with nourishing Vitamin E, the face mask set contains a coconut oil-infused pink mask for epic hydration and a chamomile-enhanced blue mask for deep cleansing. Paint your face with fun designs and watch the colors combine to create a beautiful purple mask that will leave skin feeling fresh and ultra-moisturized. The single-use mask retails for $1.49 and is available at Walmart and online at Walmart.com. Bath bombs have quickly become everyone’s favorite bath time treat, and Yum! Spa’s newest varieties in Fortune Cookie and Gumball designs are no exception. Both varieties float, bubble, mix amazing colors and contain a VIP Pass inside for special online perks. Retailing each for $1.69, the Yum! Spa bath bombs is available at Walmart and online at Walmart.com. Yum! Spa also makes haircare a snap with the Yum! Spa 2 in 1 Shampoo and Conditioner, which gently shampoos and conditions in one speedy step. And if brushing through damp or dry locks is a literal pain, the new Yum! Spa Smooth & Shiny Detangler Spray will leave hair manageable, soft and snarl-free. Both products are paraben-free and is available for $3.39 at Target and on Target.com. America’s favorite bath-time buddy, Mr. Bubble, is joining the Eastertime fun with special edition single cans of Foam Soap in Peach Sorbet and Birthday Cake. Mr. Bubble Foam Soap has always been a tub-time favorite for kids to spray and play, but just in time for the holiday, it now features a silly spray nozzle making it even easier to write, sculpt and create all while getting clean. Moms love it as it’s safe, gentle and washes thoroughly to leave skin soft and smooth. Perfect for the shower, sink and tub, the Foam Soap cans retail for $3 and is available at Walmart stores. For more bath time entertainment, try Mr. Bubble Magic Bath Crackles and Mr. Bubble Bubble Bath Minis in limited-edition Easter Egg holiday designs. Listen to the Bath Crackles POP! and SNAP! when you pour them into the water and feel them tingle and fizz in your hands. For an even bigger show, swirl them around in the water to make them crackle even louder. And who doesn’t love Mr. Bubble Bubble Bath? 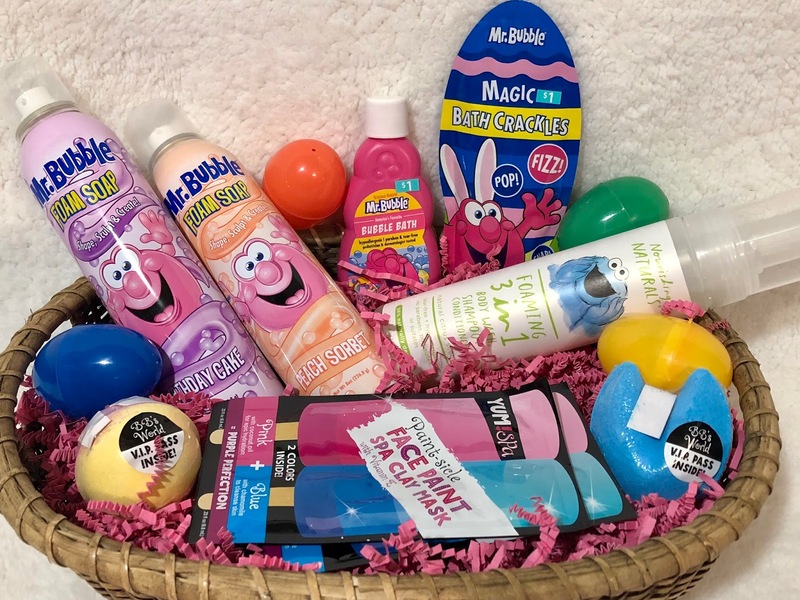 Kids will enjoy big, long-lasting bubbles in Mr. Bubble’s signature bubble bath scent in a convenient 2.5-ounce travel size, making on-the-go bathing just as fun as getting dirty. The Easter Egg Magic Bath Crackles and Mr. Bubble Bubble Bath Minis are available at Walmart stores now and retail for $1. Fruits and veggies are not only good for our tummies, but also help to nourish and protect children’s skin. Featuring Apples, Blueberries and Carrots – the ABC’s of skin health – the Nourishing Naturals bath time collection is paraben-, phthalate- and sulfate-free. Nourishing Naturals Foaming 3-in-1 is an easy and fun to use foaming formula that gently combines shampoo, conditioner and body wash to help clean and detangle hair while leaving skin smooth and soft. Made with 98 percent naturally-derived, plant-based ingredients to help repair, hydrate and protect skin, it also contains shea butter and aloe for extra moisturizing benefits. The Nourishing Naturals Foaming 3-in-1 are available now in the kids’ bath section at Target and on Target.com and retail for $5.99.